Some of my favourite memories with my late grandmother is watching 70’s, 80’s and 90’s TV shows on television after school. We’d watch Last of the Summer Wine, Judi Dench in As Time Goes By, the shenanigans of Del Boy and Rodney in Only Fools and Horses, and the Western drama Dr. Quinn Medicine. The latter focuses on a physician who moves from Boston to the wild west—Colorado Springs—much to the dislike of the townspeople, who don’t warm to a female doctor quickly. In the early 1860’s, during the American Civil War, the time which preceded the setting of Dr Quinn Medecine Woman, president Abraham Lincoln passed the Homestead Act of 1862. It allowed women to file an application to claim a federal land grant, should they make something of it in 5 years. Prairie madness was a consequence of this. Settlers faced “the risk of mental breakdown caused by the harsh living conditions and the extreme levels of isolation on the prairie.” Canadian fashion designer Erdem Moralioglu looked at prairie madness for his Spring 2016 collection. The models faces were bare, save for the smudged, peachy eye make-up. The make-up was a visual portrayal of the hardships the women were going through. A greyish organza ruffle dress with a black band draped around the neck opened the show. Vogue Runway’s Sarah Mower pointed out how sinister the addition of the black band in the context of the inspiration. Look 6 had a metallic top and skirt. The top, an off the shoulder top with bubble sleeves, and a midi-length skirt was printed with vague prints of prairie women. In theory it worked. On the runway, not so much. The following look, worn by Hedvig Palm, had a gorgeous, floor sweeping, striped skirt which embodied the prairie woman. The sheer white look that followed was also beautiful. The embellished, bias-cut gown with a scalloped hemline was another modern rework of a prairie classic. 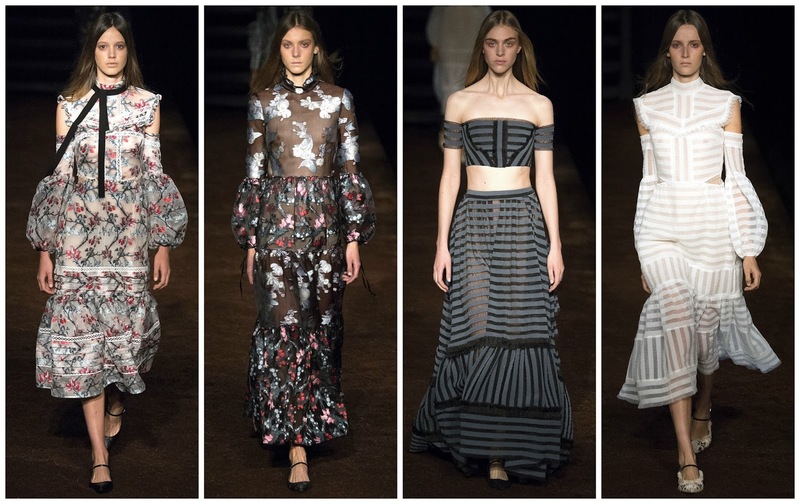 Erdem works his romantic charm with his design yet again. Ample lace, mille feuille skirts, layered organza, sheer fabrics. On paper it would appear as ‘just another Erdem collection’. Don’t be fooled. 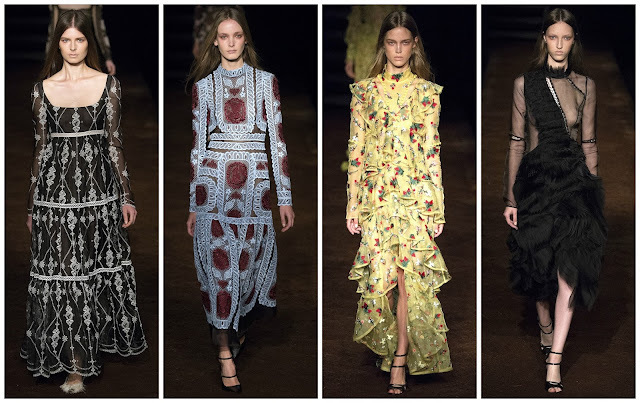 This wasn’t just another Erdem collection. It was much darker. Sure, he’s done dark before but this was macabre. The colour palette and the models faces were drained; some looks looked put-together, others tattered; some worked, others didn’t. It was when you could easily pluck a look from the 1800’s that you found yourself in the presence of a winner. Those were sublime.